I began this page in 2013. Most of this page is from then. I updated the links and prices (some came down, none went up) in October 2017. The elements I recommended then I still recommend today. They are all you need to make a "serious" start to using Arduinos. I'm going to mention specific products from a specific supplier. There are many alternatives. I Just Like Sparkfun, and would recommend that a novice start there. Once you have a little experience, if you want to "shop around", "go for bargains" (and all the "joys" they bring!)... fine! But as a novice, don't you want to minimize the chances of hassle, and have maximum support? $10 will buy you an Arduino Pro Mini 328 - 5V/16 MHz, and $25 will buy you an Arduino Uno - R3. You'll also need an ordinary PC, an ordinary USB cable. If you go for the "quick/ cheap" start, you can skip the items described below as C, D, E, and F! But all the work you will do will be entirely applicable to "going further" if you become excited about Arduino work. My "$10" is a bit exaggerated... you'll need the cable, tools, etc... but these things you may already have! But it is more "fair" than many marketing claims. And (see below) $50 is more than comfortable for making a serious start. A: A small (in capabilities) computer. Or just use your "main" computer. Until you get to advanced projects, where the computer is being used as a partner to the Arduino, saving data, maybe, you only need the "small computer" while you are programming the Arduino to do whatever you are making it do. Cost: You probably have one! You won't need the FTDI module if you go with an Arduino with that circuitry on-board, such as the Sparkfun Pro Micro, $20, 10/17, excl p&p (vs "Mini", $10, needs FTDI when being programmed))... but you buy the FTDI module once for muliple Minis, and pay the extra $10 over and over if you go down the Mini route. Maybe if one child is going to use one Arduino, at least start with a Micro, for One LEss Thing To Go Wrong. The next one can be a mini! 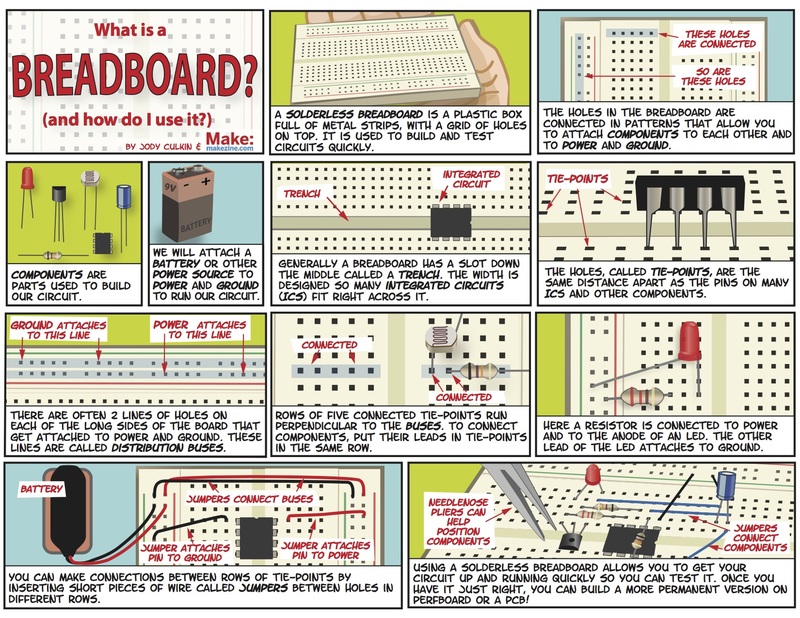 D: Breadboards, or "proto-boards": You can't have too many. Two shown in picture. Makes connecting stuff up, at least for the development stage, easy. DO NOT SKIP THESE. (ModernDevice.com/product/mini-breadboard/ $3 each, 10/17, excl p&p.) 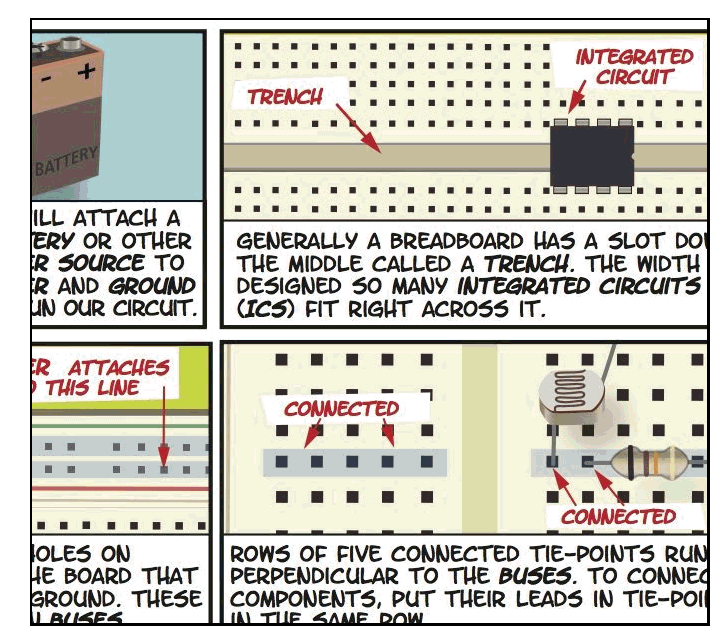 There's a wonderful graphic explanation of breadboards from Makezine. F: A "wall wart".. a source of low DC voltage. Depending on the circuits you add, you will want one supplying 9v or so. (Not more than 12)... OR you may want to power your Arduino (when not tethered to "big PC" by the USB cable) from a USB charger. N.b. : If you are using a USB charger to power your project, you need to connect the power to different pins than you would use if powering it from a higher voltage. (I would be inclined to go with the "from USB charger" route. You can connect the power via the same pins the smart cable connects to, if a USB charger is your power supply.) (Sparkfun (and the internet more broadly!) 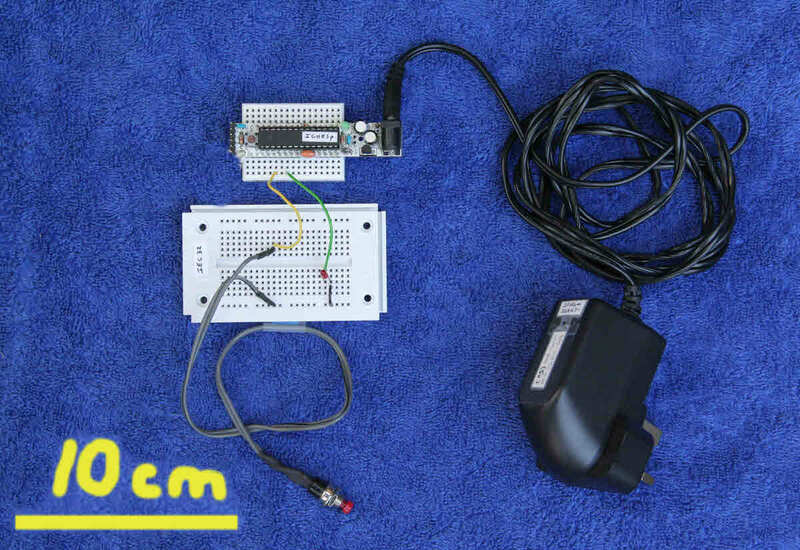 supply breakout boards to make using a standard cable easy. (The link is for a mini-B socket. ($2 each, 10/17, excl p&p. )Sparkfun also do a breakout board for the micro-B socket. If you look closely on the breadboard marked "D", you'll see an LED. There should be a resistor there, too, but I only just remembered! There's also a push button switch. And some wire. That's all you "need" to get started with Arduino. You will soon want more than one LED, more than one switch... and you can go on "adding things" endlessly... from $1 temperature sensing chips, and $10 3 character seven segment LED displays, to ethernet interfaces, GPS receivers, LCD graphics screens, etc, etc.... but these are just the input and output devices. All you "need", for basic Arduino work, is in the photo. What you see above is how you'll be set up while you are programming your Arduino. 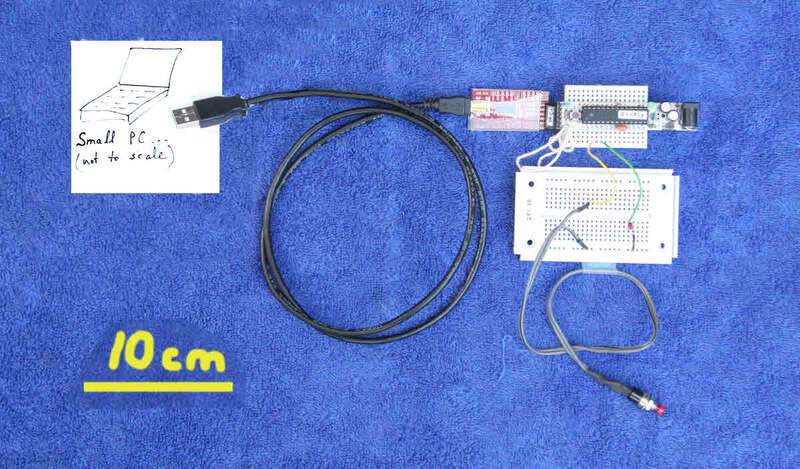 It will draw its power through the USB cable which is also being used to pass the program from the PC, where it is created, to the Arduino, where it is stored and executed. This is all you'll need once the Arduino has been programmed, and the switches, LEDs, etc, "got right". The small PC and cable will no longer be needed... they can be off doing other things... maybe programming a second Arduino to do some new project! As the Arduino was getting its power from the small PC, you now need to give it power from a different source, e.g. the "wall wart" I'd shown.